Architect: AECOM Technology, Kansas City, Mo. General Contractor: BL Harbert International, Birmingham, Ala. The roof is clad in metal paneling and coated with a rich earth-tone hue. The facility consists of a 3-story structural steel frame supporting steel trusses. From the exterior, it wields an elegant footprint in spite of its scale, one that is enhanced by a curved and colonnaded entrance façade that echoes The Pavilion’s signature curved roof. The roof is clad in metal paneling and coated with a rich earth-tone hue. Chosen from an extensive list of colors, the Fluropon 70 percent PVDF coating is a premium, high-performance product. With Fluropon’s dirt- and stain-resistant properties and its durability in all sorts of weather conditions, the combination of metal panels and coatings ensure The Pavilion’s striking roof will endure for years to come. The UltraLok Roof System is designed and fabricated with appearance and weather resistance in mind. The UltraLok Standing Seam Panel is 18 by 2 inches with factory-installed sealant and was specified from more than 10 different panel profiles. The Ultra-Lok panel is mechanically seamed, will offer weather resistance and be practically maintenance-free. Metal Panel Manufacturers: ACI Building Systems LLC and Rogers Steel Co.
College hoops are big in the life of students, fans and the local residents who often support their teams at a feverish pitch. 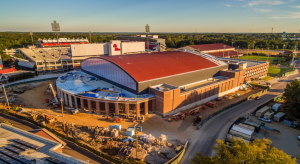 Thus, the University of Mississippi, founded in 1848 and known for its athletic programs, recently commissioned a $96.5 million basketball arena, The Pavilion at Ole Miss. The multi-purpose facility is home to the men’s and women’s basketball programs and hosts graduation ceremonies, concerts and other university-wide events. Work on the facility began with a groundbreaking ceremony in July 2014 and opened to great fanfare during a weekend-long celebration, Jan. 7-10, 2016. At 225,000-square-feet, the state-of-the-art arena seats 9,500 fans. In addition to the basketball court, it features locker-room suites for players, athletic coaches and officials. The complex also includes a private student concourse; court- side and baseline seating for students; three premium club areas—the Courtside Club, All-American Club and Pavilion Club—more than 1,700 premium seats; and an intimate seating bowl.